On 27 April 2014 Members of Serbian parliament elected the new Serbian government with Aleksandar Vucic in the office of the Prime Minister, consisting of 16 ministries and two ministers without portfolio. The cabinet was voted in by roll call. A total of 198 MPs backed the cabinet, 23 were opposed and six abstained from voting. 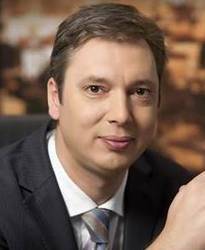 Aleksandar Vucic born on 5 March 1970. In 1988 he graduated from the Zemun high school and the Faculty of Law, University of Belgrade in 1994. He joined the Serbian Radical Party in 1993. He was elected an MP into the National Assembly of the Republic of Serbia in 1993. He was elected Secretary General of the Serbian Radical Party in 1994. He stayed in that position until 2008.He became director of the Pinki business and sport centre in Zemun in 1996. With his knowledge, management skills and abilities he reconstructed these neglected sports facilities, and with successful operation he multiplied the incomes of the employees. He was appointed Minister of Information in the Government of National Unity in 1998.He was an MP in the Federal Assembly of Yugoslavia in three terms of office: the Council of the Republics as of February 1998, Council of the Republics as of May 2000, and in September 2000 he was elected an MP in federal elections. In Belgrade mayoral elections “Vucic for the Metropolis” he won 29% of the votes in the first round, i.e., 48% of the votes in the second round. In Belgrade mayoral elections held in May 2008, he won 316,357 votes, i.e., 34, 7%. Together with Tomislav Nikolic, he founded the Serbian Progressive Party, and at the Founding Convention in October 2008, he was elected the party’s vice president. After the general parliamentary elections, held in 2012, he was appointed Minister of Defence and the First Deputy Prime Minister, in charge of fight against crime and corruption. After Tomislav Nikolic resigned from the position of the president of the Serbian Progressive Party, on 24 May 2012, Vucic became acting president of the Serbian Progressive Party. At the Second Party Congress, held on 29 September 2012, he was unanimously elected President of the Serbian Progressive Party. He served as Defence Minister from 28 July 2012 until the government’s reshuffle on 2 September 2013. Since September 2013, he kept only the position of the First Deputy Prime Minister in charge of fight against corruption and crime. After the Serbian Progressive Party won in the elections held on 16 March 2014, Vucic became Serbian Prime Minister.